A couple of weekends ago, we went down to watch a bit of the Hurley Rodeo. 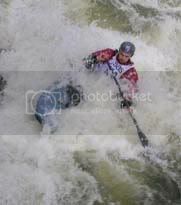 This is a freestyle kayaking event where kayakers essentially surf the water rushing through a weir and do tricks. Looks a bit crazy but fun at the same time. 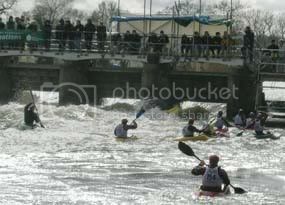 The Hurley Weir is supposed to be one of the best in the UK. Kayaking really appeals to me so I've signed up for a level 1 kayaking course at a local canoe club this May. No, I'm not looking to go freestyle but I like the idea of paddling along the local rivers or sea kayaking. Jenny is going to go on the course as well.